The layout makes perfect sense but not every stop along the tour will mark familiar territory (interstage transformer, F2a output tubes), and some of it may seem altogether puzzling to the modern mind (barrier strips and captured power cords). Let's delve a little deeper then, beginning with the interstage transformer. Properly executed, an interstage transformer allows almost perfect phase splitting across the entire frequency spectrum. In addition, transformers are ratio devices that we can employ to ratio up or down. What we want here is a super low impedance to drive the output tubes in a linear fashion. The interstage transformer used in the Sinhonia lowers the driver stage's output impedance as to better drive the output pentodes. Granted, transformers diminish gain but given the Sinhonia's ample gain from the 6BM8, this reduction in power output is entirely unproblematic. The F2a is a pentode or tetrode (depending on how one draws the distinction) produced exclusively by Siemens in Germany for professional applications. It is best known as the output tube in some of the most famous of Siemens' Klangfilm amplifiers. Klangfilm means "sound of cinema" or, in modern speak, movies with sound. These amplifiers were employed for theater use and, especially by the Japanese vintage gear cognoscenti, are currently much sought after. 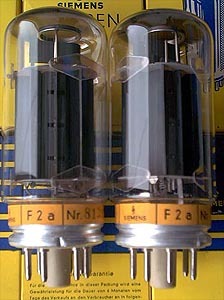 Among the most highly prized Klangfilm amplifiers are the KL-203 and 204 models, both of which used either the F2a or F2a11 tube, albeit in single-ended configuration, thus producing about 7 watts. Shindo Laboratory uses the F2a in two of its amplifier models, one single-ended (the Cortese), one push/pull (the Sinhonia). The Cortese produces ten watts and was in fact the first Shindo amplifier I listened to extensively. In the Sinhonia, the F2a produces not only a natural sound but much of the magic of a properly implemented SET design, along with the power and grip of a great pentode amplifier. While the F2a tube is rarely found in commercial designs, supply is ample. This is no "Trivista", "Nuvista" or "Buena vista" deal. Tube life for an F2a is an estimated 10,000 hours and given the Sinhonia's circuit, including soft start and stop, the tubes should last a lifetime. Should your tubes fail by chance, fear not - Shindo has an adequate supply in stock. What's more, these tubes are also available through the usual channels. But what about those barrier strips and the captured power cord? 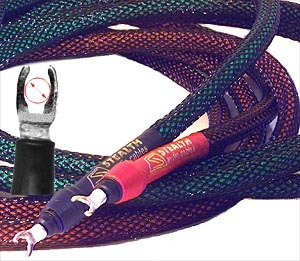 I have mixed feelings about the captured power cords but the barrier strip in fact is a sonically superior way of connecting speaker cables to amplifiers. With a bit of work, most spade lugs can be made to fit. Tinned bare wire works of course, but banana plugs are a no-no - as are those really thick lugs of questionable sonic merit. All Shindo amps employ barrier strips. Those on the Sinhonia are conveniently located but the fit between the 4, 8 and 16 ohm taps is tight so I recommend 4mm lugs. I was able to use the stock spades of my reference Stealth hybrid MLT which are a soft silver and relatively compliant. 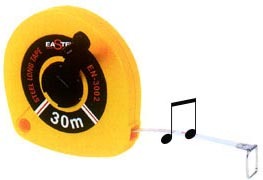 Though sonically advantageous, there is no denying that barrier strips can be inconvenient. I cannot unequivocally claim that they are worth the work. They did not present a serious problem for me but you may find them less endearing. One way of distinguishing between Shindo's newer and older products is by the presence of a captured power cord. The Monbrison preamplifier is of recent vintage and fitted with an IEC; the Sinhonia has been in production for nearly 20 years and is fitted with a captured cord. Captured or not, all Shindo-supplied power cords are of the two-prong variety. Some care must be given to insure that the amp is plugged into its power source with correct electrical phase. The difference in performance is noticeable and easy to detect, experimentation child's play because both blades are identically sized. Since the Sinhonia cords are captured, I could not test the amplifiers' performance with my usual array of aftermarket cords. Of all the power cords I was able to try with the Monbrison, only the superb Harmonix Studio Master made a discernible sonic improvement. The stock cords are that good. Still, all things considered, I would prefer a detachable cord. After all, like all other Shindo products, every tube as well as every resistor and capacitor is ear-chosen by Ken Shindo himself. The inveterate tweaker may insist on some room for (foul?) play. By the time the Sinhonia F2a arrived, the Shindo Monbrison preamplifier had dislodged the competition to become the permanent nerve center of my playback system. Sources included the Audio Logic 24MXL for digital and the Well-Tempered Classic/Roksan Shiraz combo for analogue. Speakers included the Duevel Bella Luna Diamante and Wilson Sophia. All cabling was by Stealth and power conditioning through Blue Circle's Music Ring. After-market power cords were a mixture of Harmonix Studio Master, van den Hul Mainstream and Stealth. The Sinhonias replaced my Mark Pearson-built amp using the Mullard EL-34 double getters and Cr Development Artemis Golds featuring the ubiquitous 6C33B Russian triode. I had bid adieu to all the solid state amps in house and was once again all glass. 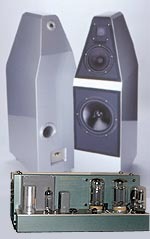 It was obvious from the outset that the Sinhonia monoblock was infinitely more resolving than any amplifier I had on hand and the equal of any I have heard anywhere, at any time. With the Monbrison/ Sinhonia combination in place, I was hearing as deeply into the system I had constructed as into the music that was being reproduced through it. I didn't have to listen too deeply, however, to determine that the system had lost its balance. Consciously or not, I had built my reference system to showcase the Mullard-based amplifier's virtues while compensating for its shortcomings. Mullards have good weighty bass and a glorious midrange for a pentode, but the amp itself -- as I now recognized -- is a tad on the dark side. Adding the Monbrison preamplifier to the mix had increased resolution, transparency and nuance, but the overwhelming character of the system remained largely determined by the amplifier's sonic signature. Together with the very natural and relaxed Duevel Bella Luna, I had created a system of good resolution, with a natural and warm tonality, one that was friendly to an extraordinary range of recordings and types of music - involving, satisfying and easy on the ears. I had obviously compensated for the relative darkness of the sound in a variety of ways, something that was made abundantly clear by the Sinhonias' impact on the system. The next couple of weeks were devoted to locating the sources of the imbalance. I switched cables and cords; tried different tuning devices; spun lots of vinyl and aluminum. In time, it was clear that something was amiss with the sources. My previous transport was the major culprit. It spotlighted the presence region and was prone towards a brittle presentation. At the same time, I had unwittingly set the VTA in order to add a leading edge that was somewhat blunted by my amplifier's rounded sound. With the Sinhonias in place, these features of the earlier playback setup were no longer compensations but distractions. I replaced the transport and adjusted the VTA. By the time I had fixed both problems, I had also inserted one meter of PSC interconnect between the Audio Logic DAC and Monbrison preamp, and had substituted for my reference Stealth a 10' pair of Audience Au24 speaker cable between the Sinhonia and both the Duevels and Wilson Sophias. With balance -- albeit a very different one -- restored, I settled in for a period of serious listening. I did so expecting glorious sound and the enjoyment of one of life's simplest and greatest pleasures: Music. I got that and more, much more in fact -- a voyage to the frontiers of music reproduction without precedent in my thirty years as an audiophile. I was about to embark on a journey that would ultimately force me to reassess what is possible in audio playback and to revise the standards by which I take the measure of audio equipment.